Valentine’s Day is often about making a good impression. So, it helps if you did a bit of research on the kind of food lover your partner is, and perhaps go beyond finding out if he or she is the sort that will eat almost anything on the menu or someone who counts calories. With such a variety of amazing dining experiences available these days, there's surely a perfect place for your special someone. Your partner ‘lives to eat’ and is always updated on the hottest restaurant openings, and probably wouldn’t think twice about getting on a flight for a memorable meal cooked up by the likes of Massimo Bottura or Alain Ducasse. Why fly your date halfway across the world for excellent French fare when you can have it right here? Executive chef Vianney Massot (formerly of the now-defunct L’Atelier de Joël Robuchon), pulls out all the stops with two delectable Valentine’s Day menus. First is the three-course menu (5.30 to 7pm) comprising Massot’s signatures, such as the onglet beef tartare crowned with marine fresh imperial caviar, and slow-cooked bresse chicken doused in ivory sauce. Even better, opt for the seven-course menu (7.30 to 10pm) that includes the divine macaroni cheese gratin with generous black truffle shavings, and the blue lobster that's been baked in a cocotte with Sarawak black pepper sauce. Both menus end sweetly with Le Bouqet de Rose, crafted with pristine Hakata Amaou strawberries and intricately shaped like a heart. When your Valentine wouldn't say no to dinner at a fancy restaurant—for its well-curated menu, of course—but would rather do without the pomp and stuffy setting. 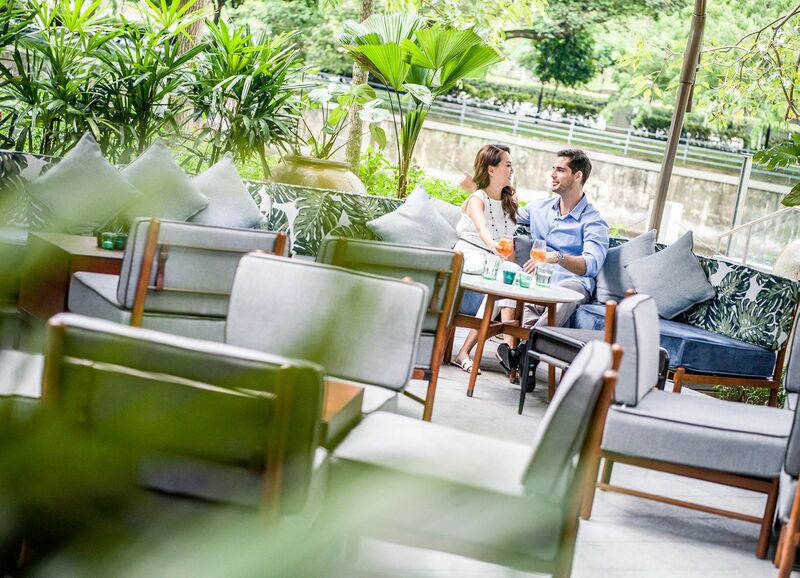 It’s got the romantic vibe down pat, and you'll get to enjoy executive chef Bettina Arguelles’ fuss-free, six-course sharing menu of delightful Italian fare. Your palate will travel to the coasts of Sicily with the zingy seabass carpaccio, and various other regions of the country with dishes such as the housemade ravioli, slow-cooked wagyu short ribs and an expected but no-less divine tiramisu to finish. But the night is still young and not too far away (next door at the terraza, to be exact) there's an opportunity to toast to a lovely evening with an Amore Eterno, exclusively created and served for Valentine’s Day. This is an invigorating concoction of Beefeater Gin, St. George Raspberry Liqueur, Liqueur de Violettes and Fever Tree Mediterranean Tonic. If a balanced diet is key, stick to a healthy balance of meat and greens. One can’t help but be drawn to its spa-like interiors and lush surroundings within Resorts World Sentosa. They set the stage for a dreamy night that gets better with celebrity chef Ian Kittichai’s five-course menu of Thai-inspired dishes. Don’t hesitate to dig in to the hor mok ma prow, a bowl full of mixed steamed seafood curry in galangal sauce, as well as the kee mao, which is essentially capellini tossed with beef short ribs imbibed with Thai liquor, green peppercorn, sweet basil, garlic, and chilli. For your sweetheart, food is best enjoyed with good wine—even better when there's something obscure like a South African pinotage on the wine list. The gastro wine bar run by owners Mathieu Escoffier and Anthony Charmetant has no Valentine’s Day menu per se; as Escoffier puts it, “what we have is already special”. He is, of course, referring to the unforgettable dining experience built around wines—of which they have over 800 labels to choose from—and sumptuous Burgundian fare. Escoffier and Charmetant aim to surprise the diner with interesting combinations, such as the 2016 Domaine Henri Boillot Corton-Charlemagne Grand Cru (made with 100 per cent chardonnay) paired with Hokkaido scallops baked in a puff pastry with black truffle and served with a drizzle of vermouth sauce. The 2004 Domaine Auguste Clape Cornas (100 per cent shiraz) with the beef Rossini topped with pan-seared foie gras and bathed in luscious perigueux sauce is another exemplary pairing. Dinner that involves a buttery, well-marbled steak cooked medium rare? Always a good idea. This heaven for those who love their premium steaks. And for its Valentine’s Day menu, the highlight is the classic USDA prime New York sirloin, aged for 28 days; it’s served with creamed spinach and German potatoes on the side. That being said, if you prefer some variety, the king salmon tartar brings beautiful marine freshness to the table, while the Beverly Hills chopped salad is the perfect steak companion. The latter is a good mix of spinach, lettuce, peas, corn, hearts of palm, with a good drizzle of citrusy sauce. The menu also comes with a complimentary glass of Tattinger Champagne. It’s the sugary stuff that tickles your date's fancy, why not start and end a meal with sweet treats? As expected, the meal starts on a sweet note, not with desserts but with L’Amour, a luscious cocktail concocted with velvety raspberry puree, Calpis, and sparkling wine. Savoury starters include a pumpkin velouté topped with onion ash for a charred finish, as well as cured salmon tartare with creamy sherry vinaigrette and pickled vegetables. Mains are a choice between a pepper crusted tenderloin and the prawn risotto. Of course, the dessert here, La Rose, is the real stunner. The rose petals are crafted from dark chocolate chantilly and grand cru dark chocolate; inside is a dark cocoa sponge imbued with Grand Marnier, almond nougatine and exotic fruit caramel. Available on February 13 and 14, with two seatings available. For delicious food, artfully plated, and interiors that are equally Instagram-worthy. You’ve got two choices here—either you book a spot in the cosy dining room that resembles a vacation home or, for something more private and magical, the airconditioned dome that overlooks the gorgeous house and well-manicured lawn. The former offers a four-course sharing menu; start light and easy with the Alaskan king crab rillette atop a crunchy brioche toast, before going big with mains including the grilled Sanchoku wagyu rump cap MBS 7 doused in port wine jus, and sustainable red snapper served with greens from the farm. As for the latter, it’s a five-course sharing menu that’s a bit more luxurious with creations like Boston lobster topped with tomato jelly and caviar; pan-seared foie gras caviar and iberico crumb, and wood-fired Tajima Wagyu Oyster Blade MBS 6-7. To boot, dinner comes with a special bottle of wine and a flower bouquet for her. Head chef Drew Nocente’s commitment to sustainability has led him to a solid menu that uses the ‘whole hog’—be it a pig, cow, lamb or bird. This extends to his Valentine’s Day ‘Feed Us’ sharing menu that delights and surprises with interesting combinations, such as creamy uni and lardo, which is essentially back fat, with oyster, yuzu dashi and ginger flower. The menu is that perfect balance of seafood and meat, too. After you’ve savoured the salmon beautified with cucumber, ikura and pickled sorbet, you can prepare to tuck into a hefty portion of venison, jazzed up by sunchoke, pickled mustard seeds and onion on the side. While you're here, feel free to toss in more exotic items (available a la carte) such as the salt & pepper tripe, blood sausage arancini and kangaroo meat.